In today’s environmentally-focused world, it’s vital to consider the well-being of the fish inhabiting the waterways in which culverts are installed. 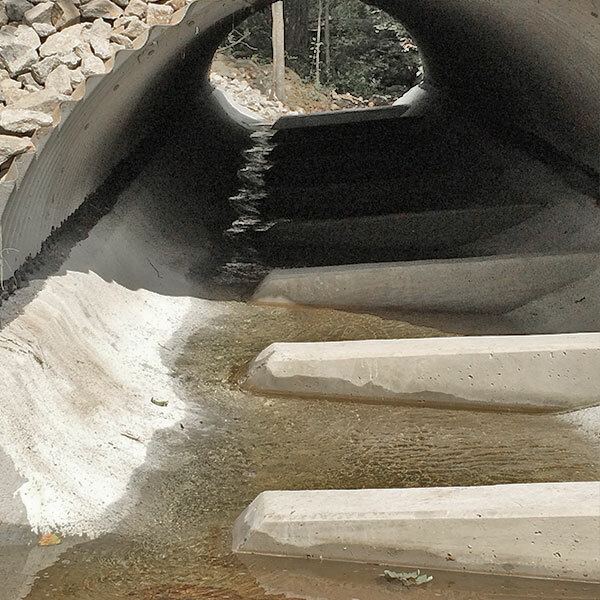 If improperly installed, a culvert can eliminate the spawning route of migratory fish, introduce contaminants into the watershed, and alter water flow or water temperatures. As a Maine company, C.L.H. & Son, Inc., takes pride in following environmentally safe practices when building a site to the engineer’s specifications. Fish passage in Gray, ME by C.L.H. & Son, Inc. If you are interested in our fish weir services, please contact us today. We travel anywhere in the Northeast. Spillways play an important role in waterway infrastructure, and our professional staff know how to repair and maintain a spillway’s integrity. If you have a spillway, pipe, or fish passage in need of repair or examination, contact us today! Nothing lasts forever – not even culverts. Given enough time, culverts begin to deteriorate and degrade, which can result in catastrophic infrastructure issues. Instead of replacing the pipes, we can clean and slip-line them. It’s a cost-effective solution for returning a culvert to its intended state. About C.L.H. & Son, Inc.
C.L.H. & Son, Inc. and Culvert Rehabilitation Services is the only company in New England that exclusively specializes in the inspection, evaluation, and rehabilitation of aging culverts.